The windowless cubicle. Most offices have at least one. But did you know that sitting where the sun don’t shine might actually be hindering your employees productivity? Lighting is often overlooked by many employers, but it can greatly affect the performance and happiness of your staff. Read on to learn some of the benefits of natural light in your workplace, and the science behind them. A circadian rhythm is a 24 hour cycle in the physiological processes of living beings. This cycle is greatly affected by environmental factors like sunlight or temperature. Your circadian rhythm controls your internal clock, which means it’s responsible for releasing the hormones that make you feel tired, or conversely the ones that make you feel awake. Exposure to natural light triggers your internal clock’s “on” and “off” switch. Without exposure to a normal 24-hour light–dark cycle, a person’s sleep–wake cycle can stray by as much as two hours per day. So what does this all mean? If you’re stuck in an office where the only light source is artificial, your circadian rhythm is likely out of whack! We all know that the less rested you feel, the less you feel like putting in a hard eight hour day. Researchers at the Interdepartmental Neuroscience program at Northwestern University in Chicago found a strong relationship between workplace daylight exposure and office workers’ sleep, activity and quality of life. In fact, compared to workers in offices without windows, those with windows in the workplace received 173 percent more white light exposure during work hours and slept an average of 46 minutes more per night. Better sleep equals more energy, which means increased productivity! If you’re employees are sleeping better due to receiving more natural light at work, you will see the benefits in more ways than just a more upbeat and energetic staff. A restful sleep will also keep your workers healthy! Moreover, artificial light can be very hard on a person’s eyes, and can lead to eye strain and migraine headaches. Utilizing more natural light is easier on the eyes, and will lead to less missed time at work. While there may be an initial investment if renovations (such as adding interior glass walls) are required to incorporate more natural light into your office, you’ll soon start to make back your investment. Lighting in buildings consumes a hefty chunk of your electric bill, so why not cut that down by using a natural light source! In fact, most offices will see at least a 20 percent decrease in their power bill after cutting down on artificial lighting. The benefits are clear. 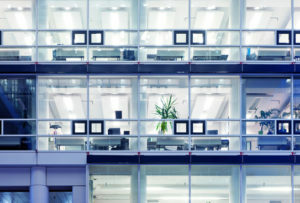 Increasing the natural light in your office will help boost moral as well as your bottom line. If you are ready increase the productivity and satisfaction of your employees, give the team at Marcotte Glass a call! They are Calgary’s commercial glass experts and will make sure you get exactly what you are looking for.